The Wi Audio Stream Pro SL Smart Pocket Portable, Stereo Digital Wireless Microphone & Audio Monitoring System with built-in USB 2.0 Wireless Audio connectivity, redefines the wireless experience for professionals who demand high quality audio, extreme portability and uncompromised universal audio connectivity for live performance, Video Camera, DSLR, Digital Recorders, Smartphones and today's digital gear. 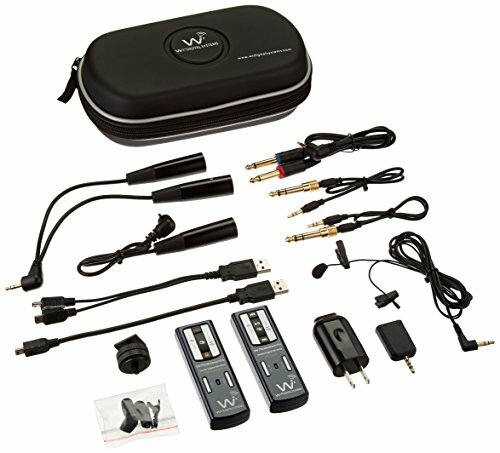 This wearable 2.4GHz true diversity pocket portable stereo digital wireless system quickly interchanges from Lavalier MIC to audio monitoring system with a simple swap of accessories while providing up to 100 feet of secure, uncompressed 16 bit, 48 kHz CD quality, wide 15Hz to 20 kHz frequency response wireless audio connectivity without radio frequency (RF) interference, signal loss, or crackle inherent in UHF/VHF systems. The entire system can fit into the palm of your hand! The Wi Audio Stream Pro SL delivers elegant simplicity, superior sound, professional dependability, powerful high-speed processor with massive and features simply unavailable from other wireless systems. Equipped with premium professional grade 0.12 inch in capsule diameter, 20Hz -20 kHz, 140 dB SPL max stereo omnidirectional lavalier microphones lets you capture superb vocals and amazing ambient sounds easily and accurately. Super strong, universal mount metal belt clip with 1/4"-20 screw mount to securely mount on a variety of camcorders, DSLR cameras, or other A/V gear using the included hot shoe adapter.